You are asked to bring in reinforcements for Bruma from the other towns. This is an optional quest that can be done at any point after completing Bruma Gate and before starting Defense of Bruma. You can also partially complete it - i.e. get aid sent from some, but not all of the cities. Once you have completed the Defense of Bruma, Allies for Bruma will be automatically marked completed in your journal, even if you did not recruit everyone. You are sent to request more troops for Captain Burd. He tells you to petition the other cities, the guilds, and the Elder Council to send temporary relief troops to Bruma. Go to each city and ask the count or countess of each for "Aid for Bruma". After each city has provided aid, that city's troops will set up camp in Bruma. Jauffre tells you that the Daedra are innumerable while the Bruma town guard are not. He therefore asks you to go and petition the other cities in Cyrodiil, the guilds and the Elder Council to send temporary relief troops to help close any Oblivion Gates that open around town. Visit any or all of the cities marked by quest markers on your map and ask the count or countess for "Aid for Bruma". If you visit the Imperial City, High Chancellor Ocato will refuse to call in the legions as they are needed to maintain order in the other provinces. Note that the moment you enter the Imperial Palace District, Ocato will start to move towards his quarters, which are past an unpickable locked door. If this happens, move out of the Imperial Palace district, wait for an hour, then go back and head immediately for the palace. Ocato should be just inside the main door when you enter. In Kvatch, you must first complete the Battle for Castle Kvatch and then ask Savlian Matius for aid. If you previously did this quest, Savlian is still standing in the ruined castle. Even though the city is still burning, Savlian will send one anonymous "Kvatch Soldier". For each of the other six cities, the ruler will refuse to send aid until you close the Oblivion gate threatening their city; these gates all opened after you completed Dagon Shrine. Enter each of the six Oblivion gates in turn, take the Sigil Stones to close them, then ask the counts or countesses of those cities to relocate guardsmen to Bruma. They will be so glad that you closed the gates that they will give up a few soldiers and send them to Bruma. Note that when you talk to the ruler of those cities, the quest markers for all cities will disappear to be replaced by the quest marker for the specific Oblivion gate to close. Once the gate is closed and the count or countess agrees to send soldiers, the quest markers for all incomplete cities will re-appear. ^ Each group of soldiers will set up a camp in Bruma just outside the castle once their count or countess sends them. ^ The Wayward Knight will no longer be available after this gate is closed. The Fame point earnings for this quest are broken down like so: for each city, you will get +1 fame at the moment that you grab the Sigil Stone and close the Oblivion gate. You'll get another +1 fame at the moment that you report to the Count(ess) and are promised a soldier. In Kvatch, you get +1 fame when you talk to Savlian Matius for this quest. So not including Oblivion Gates and not double-counting fame for related quests, the maximum fame from this quest is +7; the Oblivion Gates you will close as part of the quest give you an additional +5 fame, at the very most. You can close the gates before speaking with each count, but if multiple gates have appeared outside the city then speaking with the count beforehand will give you a quest arrow leading to the correct gate for the quest. Anvil, (possibly) Cheydinhal and Chorrol each provide two soldiers instead of just one, so if you are only going to get allies from a few cities, it is recommended that you include these. Although Jauffre suggests that you ask the guilds for help, there is no official way to get them to send troops for this quest. Any soldiers you decide not to recruit will be replaced in the battle by the Bruma Militia, who wear less effective armor and are less accomplished fighters. Because of this they tend to get killed quite quickly during the next quest. Completing this quest is therefore advisable, even though it is optional. If Ulrich Leland is not imprisoned (see Corruption and Conscience) you can ask him about Aid for Bruma. The dialogue is identical to that of the soldiers at the Defense of Bruma, although Ulrich has no audio for it. After closing the Skingrad Oblivion Gate Janus will 'hint' at his condition, saying his kind doesn't make good slaves. There is no quest update for the situation where Viera Lerus is dead and the count of Bravil can't dispatch any troops as a result. Because of this, even if you manage to get aid from all the other cities, the quest marker will continue to point at the location of Regulus Terentius infinitely until the quest is forcibly marked as completed at the end of the Defense of Bruma. If you have started but not finished the Vampire Cure quest, you may be unable to secure Allies from Skingrad unless you manage to speak to Count Hassildor directly after closing the gate, as Hal-Liurz will refuse to talk about anything but the cure and so will not fetch the Count for you. This bug is fixed by version 1.4.0 of the Unofficial Oblivion Patch. If this happens, try waiting in the Castle Hall for a couple of hours - Hassildor should eventually come and find you himself. The console code set MS40.HalliurzTravel to 0 should cause Hal-Liurz to appear. 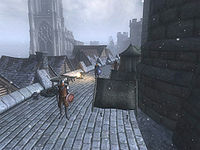 10 Jauffre is worried that the Bruma Guard will not be able to defend Bruma from a full-scale attack by the Mythic Dawn and their daedric allies. He suggested that I try to obtain support from the other cities of Cyrodiil. Perhaps I can persuade the Elder Council in the Imperial City or the guilds to help as well. 20 I spoke to the Countess of Anvil. She said she would be glad to send help, if only her own city wasn't threatened by an Oblivion Gate. I should close the gate outside Anvil and then talk to the Countess again. 21 I spoke to the Countess of Anvil. She promised to send some of her best soldiers to help defend Bruma. 22 I spoke to the Count of Skingrad. He said he would be glad to send help, if only his own city wasn't threatened by an Oblivion Gate. I should close the gate outside Skingrad and then talk to the Count again. 23 I spoke to the Count of Skingrad. He promised to send some of his best soldiers to help defend Bruma. 24 I spoke to the Countess of Chorrol. She said she would be glad to send help, if only her own city wasn't threatened by an Oblivion Gate. I should close the gate outside Chorrol and then talk to the Countess again. 25 I spoke to the Countess of Chorrol. She promised to send some of her best soldiers to help defend Bruma. 26 I spoke to the Count of Bravil. He said he would be glad to send help, if only his own city wasn't threatened by an Oblivion Gate. I should close the gate outside Bravil and then talk to the Count again. 27 I spoke to the Count of Bravil. He promised to send some of his best soldiers to help defend Bruma. 28 I spoke to the Count of Leyawiin. He said cannot send aid to Bruma with an Oblivion Gate threatening his own city. I should close the gate outside Leyawiin and then talk to the Count again. 29 I spoke to the Count of Leyawiin. He promised to send soldiers to help defend Bruma. 30 I spoke to the Count of Cheydinhal. He said he would be glad to send help, if only his own city wasn't threatened by an Oblivion Gate. I should close the gate outside Cheydinhal and then talk to the Count again. 31 I spoke to the Count of Cheydinhal. He promised to send some of his best soldiers to help defend Bruma. 32 I spoke to Savlian Matius of the Kvatch guard. He would like to send help to Bruma, but he cannot spare the troops until the city is completely retaken from the daedra. 33 Savlian Matius thanked me again for my help in retaking Kvatch, and promised to send whatever troops he could spare to help defend Bruma. 40 I closed the Oblivion Gate outside of Anvil. I should speak to the Countess about sending aid to Bruma now that Anvil is no longer directly threatened. 41 I closed the Oblivion Gate outside of Skingrad. I should speak to the Count about sending aid to Bruma now that Skingrad is no longer directly threatened. 42 I closed the Oblivion Gate outside of Chorrol. I should speak to the Countess about sending aid to Bruma now that Chorrol is no longer directly threatened. 43 I closed the Oblivion Gate outside of Bravil. I should speak to the Count about sending aid to Bruma now that Bravil is no longer directly threatened. 44 I closed the Oblivion Gate outside of Leyawiin. I should speak to the Count about sending aid to Bruma now that Leyawiin is no longer directly threatened. 45 I closed the Oblivion Gate outside of Cheydinhal. I should speak to the Count about sending aid to Bruma now that Cheydinhal is no longer directly threatened. 50 I spoke to Chancellor Ocato, the head of the Elder Council. He was unable to promise any soldiers from the Imperial Legions, since they are all tied down in the provinces fighting the daedric invasion. He suggested I ask the Counts and Countesses of Cyrodiil for help. 90 The Countess of Bruma urged me to obtain any additional help that I can find. She fears that her troops will be overwhelmed before I can close the Great Gate. 95 I have obtained allies from everyone that might help. Bruma is as well-defended as possible. It is possible to use the console to advance through the quest by entering setstage MQ11 stage, where stage is the number of the stage you wish to complete. It is not possible to un-complete (i.e. go back) quest stages. See SetStage for more information. Esta página foi modificada pela última vez à(s) 00h08min de 11 de dezembro de 2014.